I've been hearing loads of good stuffs about Brussels Beer Cafe, be it over at their branch in Jaya One, Ampang, or Solaris Dutamas. Well, over the weekend, got a call from my friends and we decided to crash in for a quick meet-up and lunch at Brussels Beer Cafe over at Menara Hap Seng. The cafe itself was located at the ground floor in full view of the streets outside, so it's hard not to miss it. 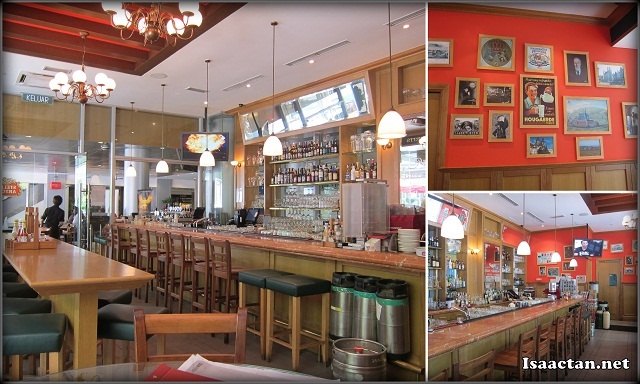 It was mid day when I reached Brussels Beer Cafe, and the ambiance was good. I can imagine at night when the crowds come in for their huge selection of beers and wines. The furnitures, chairs, TV, even the wine glasses were set perfectly in place in a clean cozy environment. One of the reasons we chose this cafe to have our lunch was the fact that Brussels were having their Set Lunch promotion. 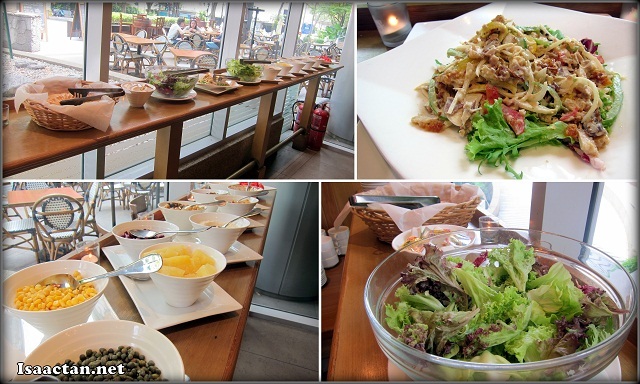 Now this lunch menu is real value for money I tell you, for RM19.80++ we can get unlimited access to the delicious salad bar, one soup of the day (mushroom soup that afternoon), one main course, and soft drinks. It was definitely value for money, and the food tasted good too. I actually took for myself 4 servings of the salad from their salad bar. It was a "make-it-yourself" Caesar Salad, and I have to say I'm in love with the bacon bits all mixed together with the salad with those crunchy bread crumbs pieces. I was satisfied dining on the salad alone, yet it was satisfying to know my RM19.80++ will get me a bowl of mushroom soup, with a main dish plus soft drinks. The choices of main dishes this week consisted of Grilled Lamb Chop, Fish and Chips, Spaghetti Bolognese, and the vegetarian dish Ratatouille 'Pastilla'. I went for the Grilled Lamb Chop while my other friends took the Fish and Chips and the Ratatouille 'Pastilla'. Don't let the slightly burnt out looks of the Grilled Lamb Chop deceive you, as it tasted like it had been marinated for days before being grilled and served for me. Needless to say it was really tasty. Now if only they toned down slightly on the fire. The lamb chop came with a generous slab of mashed potato to fill you up further. The Fish and Chips were served with fries which tasted like any other Fish and Chips should taste like. Nothing unusual there, but I was rather intrigued with the Ratatouille 'Pastilla', which came looking like the above with no meat in sight save for the cheese. I was not a fan of the eggplant hence did not try this dish. My friend mentioned it was good though. I was told too that Brussels Beer Cafe serve some really good and fresh beers which caters for the night crowd. My Belle-Vue Kriek was ordered upon recommendation from my friend, which I happily drank away to drown out all my sorrows. I would say it was a good afternoon out with friends, and I wouldn't mine returning again. Their pork knuckle best pun..
Love the look of the place...the food looks good too. I love German food especially the pork trotters. I don't drink beer anymore though... Sigh!!! I usually go to the Brussels at Jaya One but not for the food. I hardly eat when I'm there. I *love* the beer though. Belle-Vue Kriek is good, as is some of their imported stuff. I usually go for that instead of the ones on tap. There are a lot of specialty beer cafes now. Library (is it still open?) used to have this corked beer from a monastery. The bottle costs about RM 70 (!) - it's a near to 500 ml - fits into a pint glass perfectly. Have yet to try out their famous pork knuckle... they are famous for that, right? i like the deco, especially the bright orange wall, so cool.. oh, the food looks good too, i like that Ratatouille 'Pastilla'..
RM19.80 for set lunch, very attractive deal. Oh the Belle-Vue Kriek really can ease my thirst in hot sunny day.